Meet the easy-to-use desktop 3D printer with a large build volume that delivers accurate, industrial-grade parts, time and again. 5 495,00 € 5 495,00 € tax excl. Built to run continuously and maximize uptime, Ultimaker S5 combines dual extrusion, advanced connectivity, and an open filament system – ready to make 3D printing accessible for even more applications, from rapid prototyping to creating on-demand tooling and end-use parts. A large build volume for a desktop 3D printer lets you print bigger models, or put multiple parts on a single build plate so you can meet demand with maximum efficiency. Print with a wide range of engineering materials and easy-to-remove support. Ultimaker’s dual-extrusion technology enables designers and engineers to create complex geometries, for applications from prototyping to manufacturing aids and end-use parts. Enhanced multi-point bed leveling ensures a perfect first layer by compensating for slight variations in build plate topography, and sensors monitor material flow while printing – so you can trust the S5 to do its job while you do yours. no need for training. This is powerful 3D printing, without the hassle. A build volume of 330 x 240 x 300 mm is the biggest yet in an Ultimaker 3D printer, but still fits comfortably on your desk. Thoroughly tested printing profiles in our Ultimaker Cura software, smart printer features, and a new material option – Tough PLA – ensure great results and unparalleled ease of use even with large prints. Glass doors help control airflow inside the printer for even better print quality and reliability, as well as providing added safety. A glass plate is also included. A quality 3D printed part is built on a good first layer, which needs a level bed. The Ultimaker S5 print head’s capacitive sensor scans the build plate at multiple points and compensates for any tiny variations in its surface by adjusting the Z-axis height in your print’s first layers, ensuring your print starts perfectly, time and again. Ultimaker S5 detects if you need to replenish filament during a print, pauses, and notifies you to add more material before resuming. The result? You can still finish a print even if you run out of material – and more successful prints means greater return on your investment, and increased efficiency. Ultimaker’s dual-extrusion technology is the most reliable on the market, enabling you to print in two materials or colors. 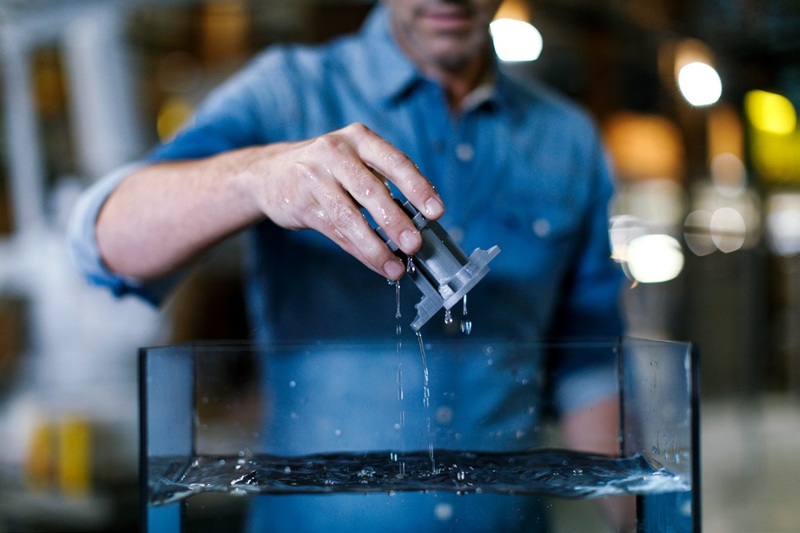 Print with Nylon, CPE, or PLA combined with water-soluble PVA support material to realize complex, technical models, then simply dissolve away supports to leave a flawless surface finish. Material-matching print cores with built-in EEPROM chips are auto-detected by the printer, minimizing downtime during configuration. Swap print cores in seconds to switch from a build and support material combination to dual-color 3D printing. Print cores are available in a range of nozzle sizes, from 0.8 mm for rapid prints down to 0.25 mm for fine detail. 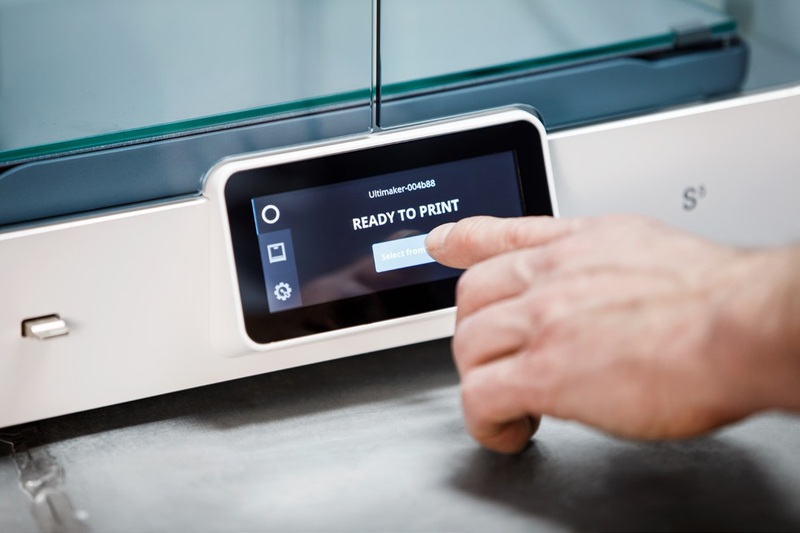 A 4.7-inch (11.9 cm) touch display makes operation effortless, with images to help explain how to configure the printer, plus a visual preview of your print. 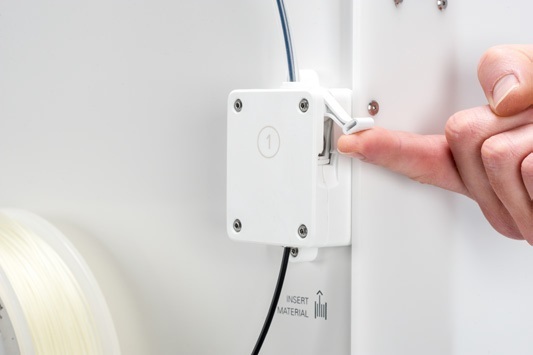 Ultimaker S5 is designed for an easy user experience in every way, with the power adapter now integrated into the printer for easier installation, especially when placed on a rack. 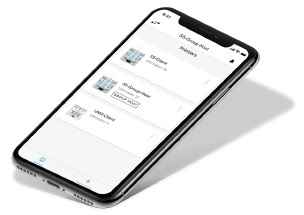 You can now control your Ultimaker 3D printers with a few taps from your phone or tablet when you’re on the same local network, and get notifications wherever you are so you can always stay updated on your print’s progress. The Ultimaker app is available free on Android and iOS, and works with Ultimaker S5 and Ultimaker 3 3D printers. The Ultimaker S5’s built-in connectivity delivers a seamless 3D printing experience, so you spend less time setting up and checking your 3D printer and more focusing on important tasks. Trusted by more than 2 million users, Ultimaker Cura prepares your 3D model for printing. And with preconfigured Ultimaker S5 profiles, you get the best results instantly. 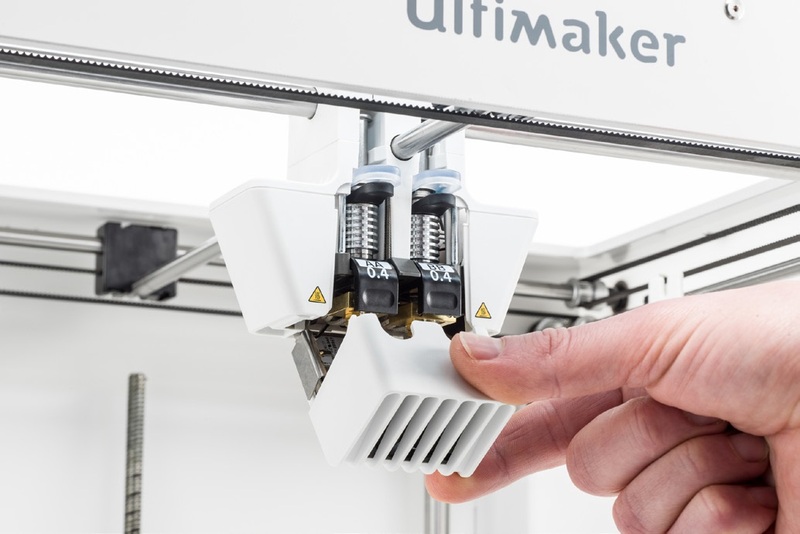 Connect one or more network-enabled Ultimaker 3D printers and create your own automated, mini-production line – perfect for 3D printing in the office.